Zucchini Slice | sweet ravioli! When I think of zucchinis I think of zucchini slice and zucchini fritters and today I’ll be sharing my recipe for zucchini slice. My earliest memories of zucchini are them growing in my parent’s yard. They were not the piddly little zucchinis you get in the supermarket. These were as big as my forearm! After giving some away to friends and family my mum might slice them and fry them in hot oil or join them with eggplant to make a parmigiana. Occasionally she would make zucchini slice. After many years and a few recipes I’ve settled on this zucchini slice recipe which is inspired by Julie Goodwin’s recipe. I never have a failure with her recipes. Zucchini slice makes for a quick, easy dinner on a night when you’ve run out of ideas and perhaps you can’t stomach any meat like chicken or beef. My kids enjoy this with a bit of mayonnaise and there is always some leftover for lunchboxes or a snack. Preheat the oven to 170 degrees celcius. Grease and line a slice tin or baking dish. 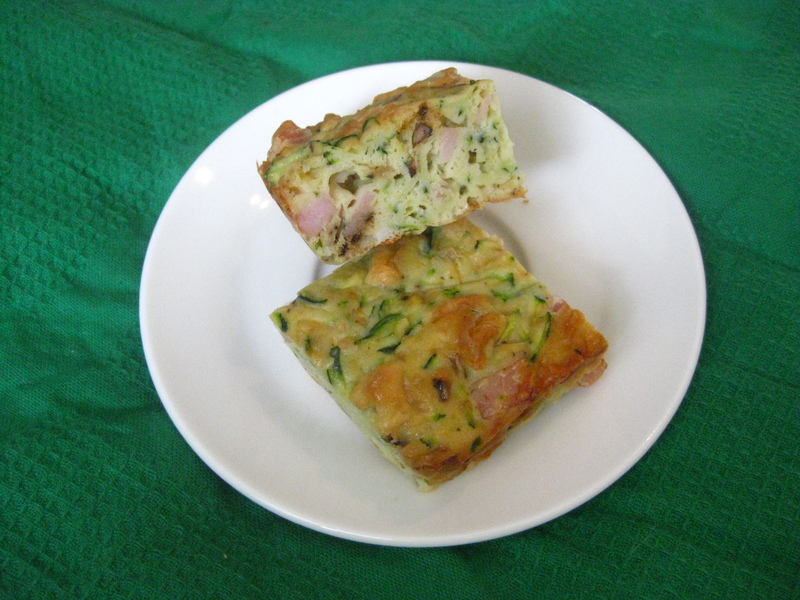 In a large bowl combine the zucchini, carrot, bacon or ham, cheese and flour. In a separate bowl whisk the eggs then add the oil and whisk again. Add the egg mixture to the large bowl, add the garlic and onion powder, salt and pepper and mix until well combined. Pour into your prepared dish. Push the tomato halves lightly into the top of the mixture. Bake in the oven for around 40 minutes or until nicely golden brown. Let sit for 10 minutes before cutting into squares. Best served warm or cold. Rachel, this dish looks nice and compact with lots of flavours. It reminds me of ‘kugel’- a dish made with egg noodles, but I see there aren’t any noodles in your dish! Yum! !